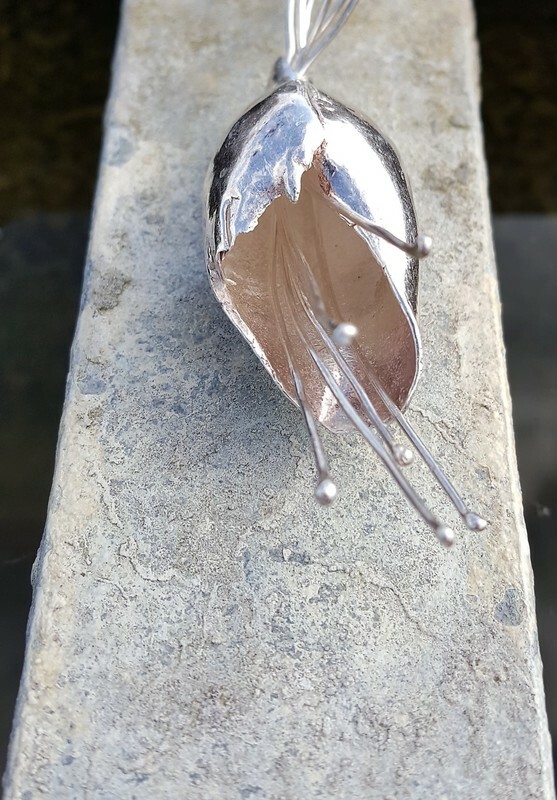 Hanging on a 45cm sterling silver snake chain. 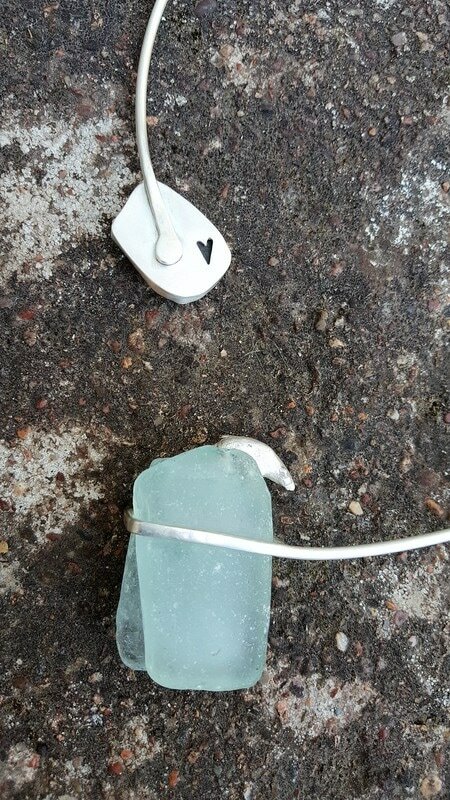 Catch of the day is a pale green sea glass pendant, maintaining echos of its previous incarnation as a rectangular bottle base, complete with stamped SG lettering. Embellished with 2 etched fish, gilded in silver leaf. Found on Dorset's jurassic coast. 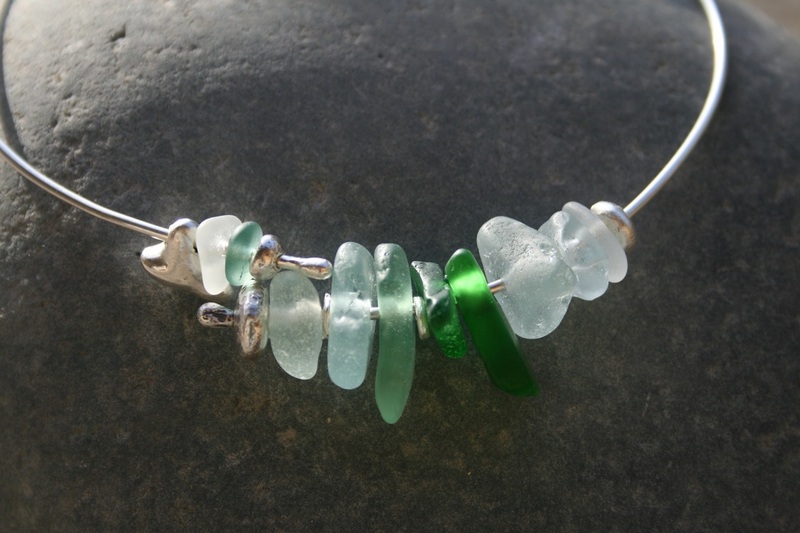 The glass measuring 7cm x 3cm and hangs from a 45cm sterling silver chain. Gilded clay egg with white feather wings. 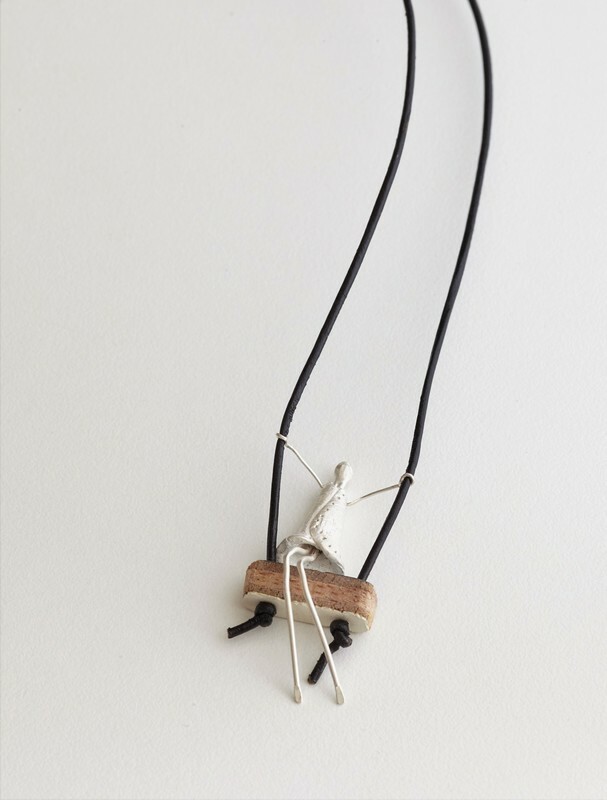 Hanging from a thin leather cord with a hand made stirling silver catch and a fine silver little base designs tag with foot logo. 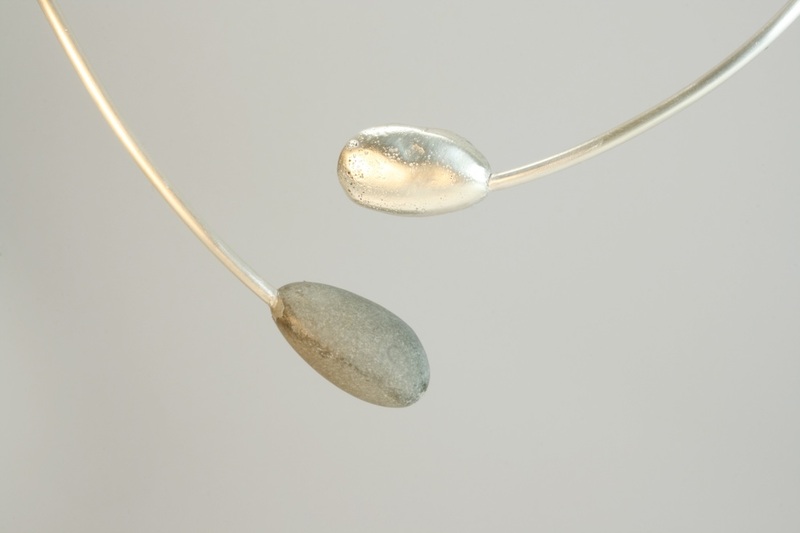 Delicate necklace with moving parts. 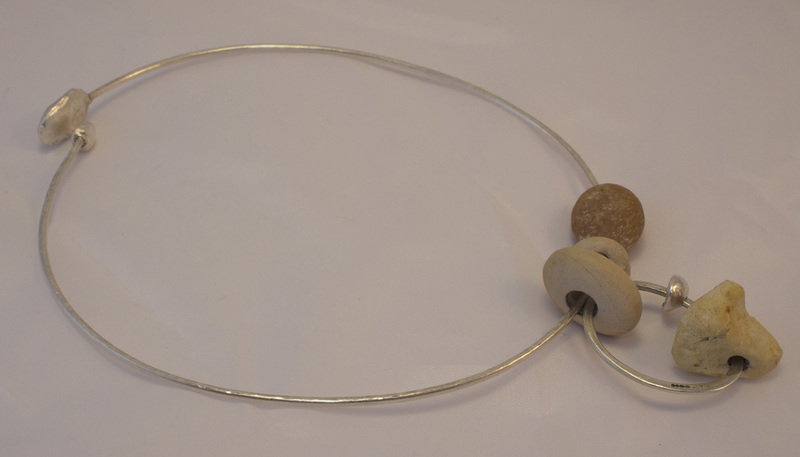 4.5 cm diameter hoop with 5 china clay cups and 1 fine silver cup. 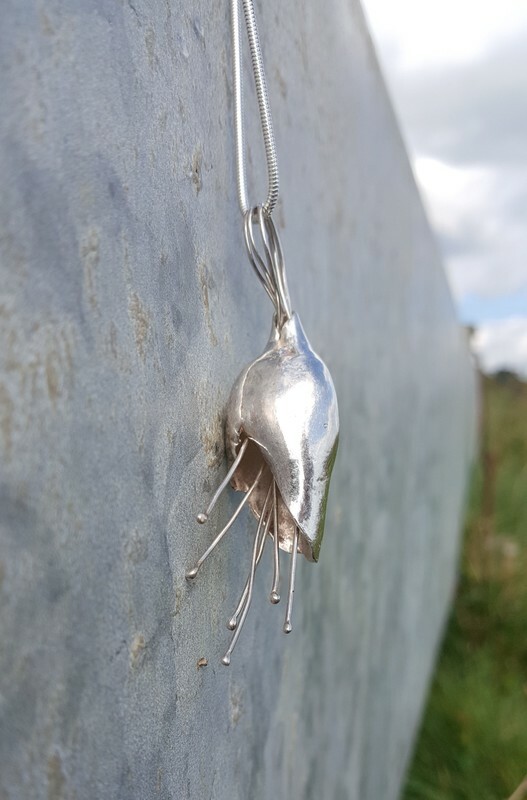 Hanging from a 45 cm snake chain. 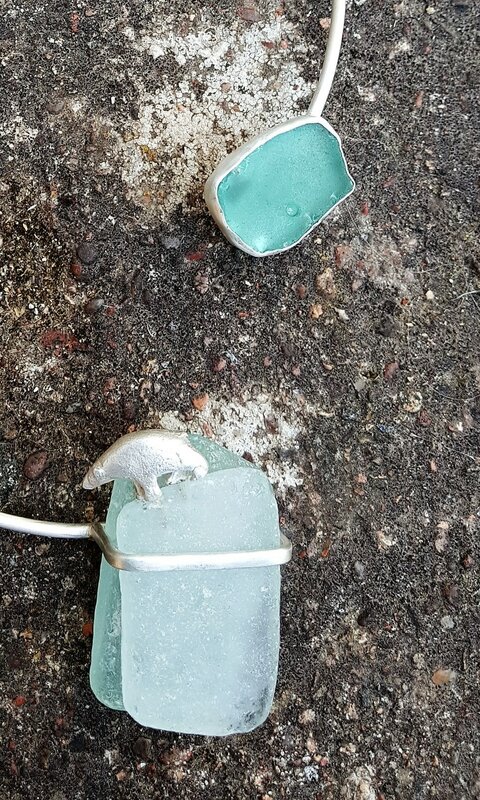 3.5cm x 2cm, length adjustable. 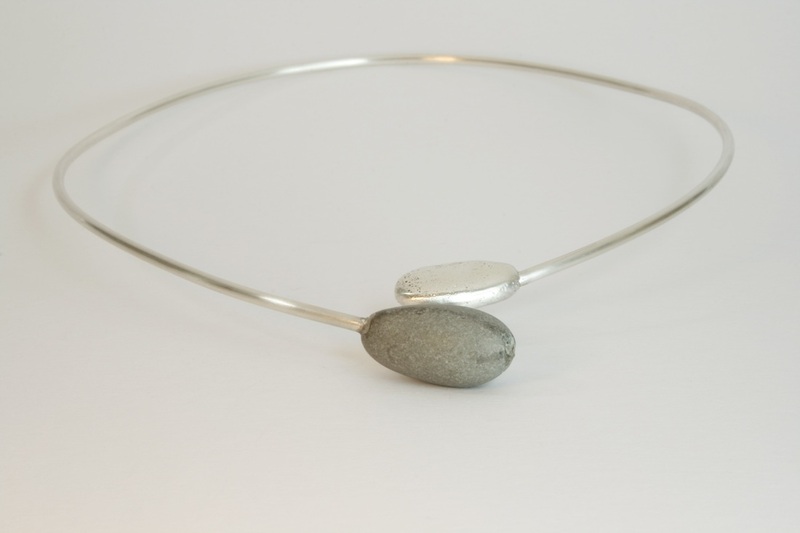 Dainty, tactile piece, combining hand made white china clay dish and cup with sterling silver off centre hoop and pebble. 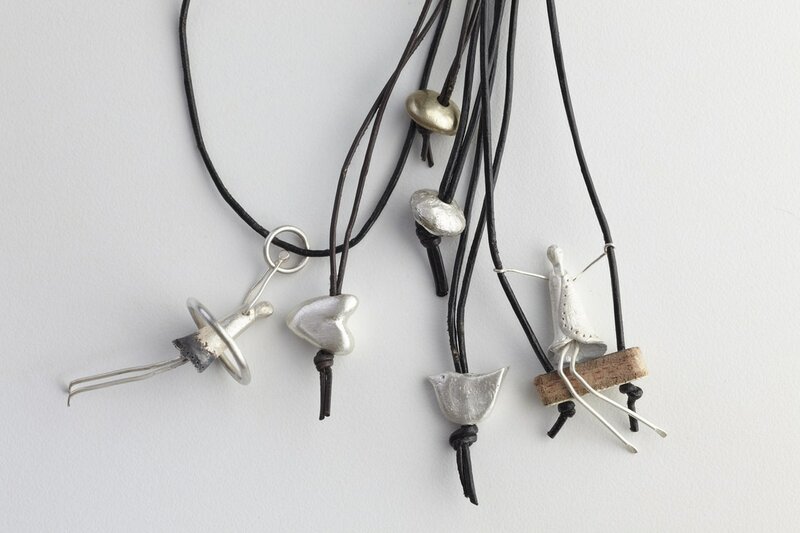 Hanging from a sterling silver post and leather thread. Hand made catch. Natures heart, nestled in a vintage glass cup. Striking piece. 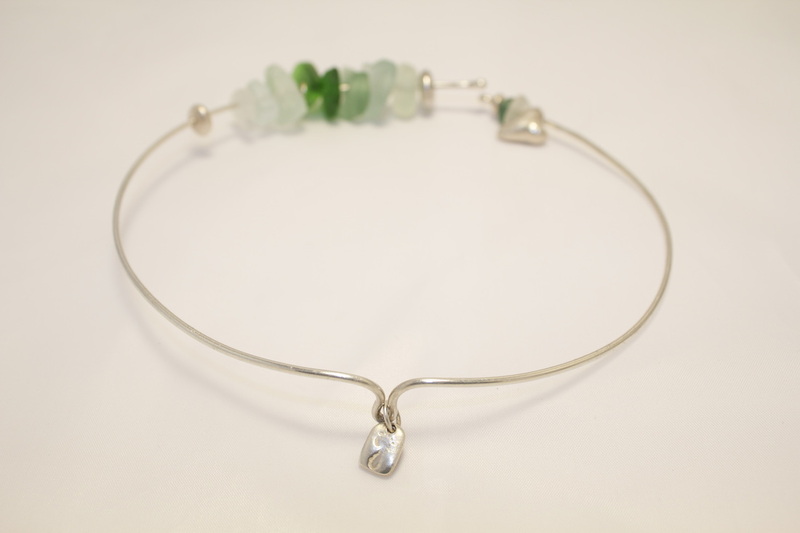 Thick 3mm wire band. 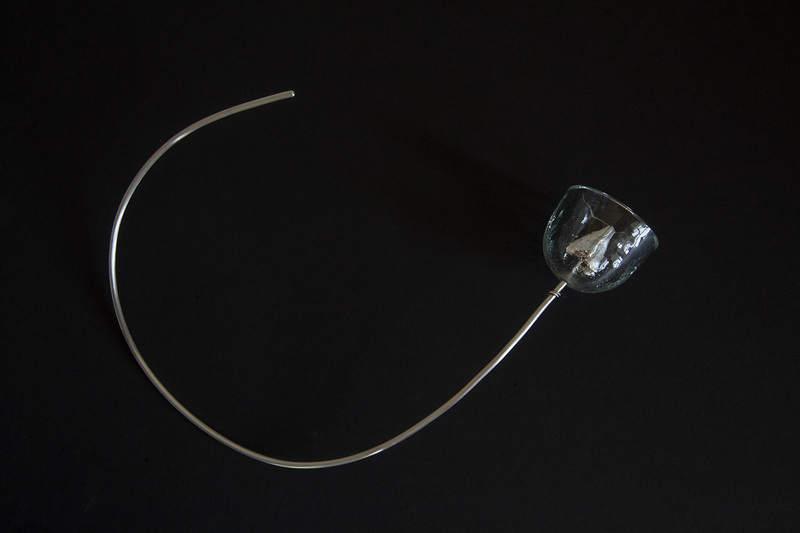 The glass cup has a 3.8cm diameter and is 3cm high. 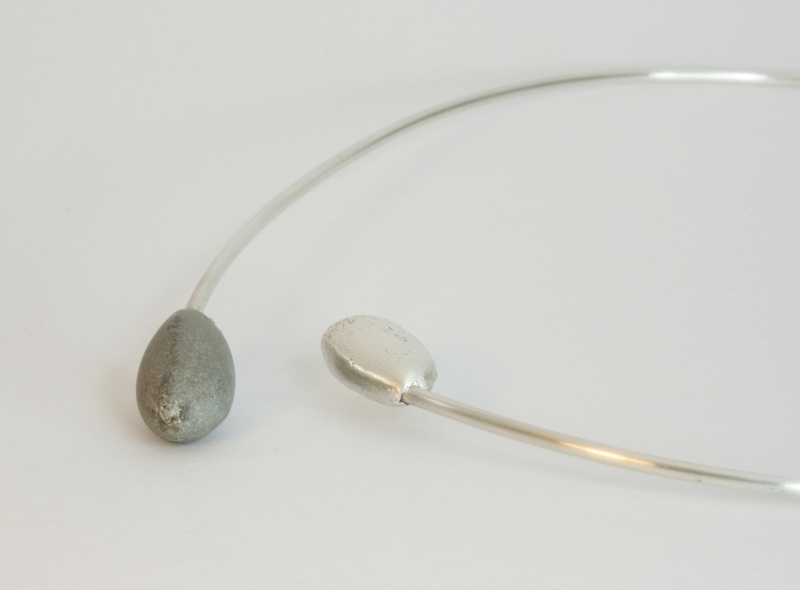 Elegant tensioned sterling silver wire necklace with grey beach pebble and silver pebble end stops. 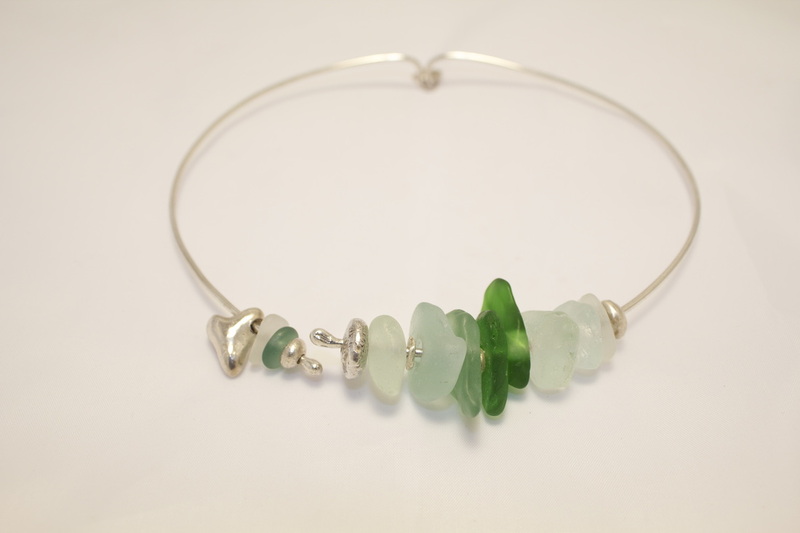 Hanging frosted, white sea glass hoop. 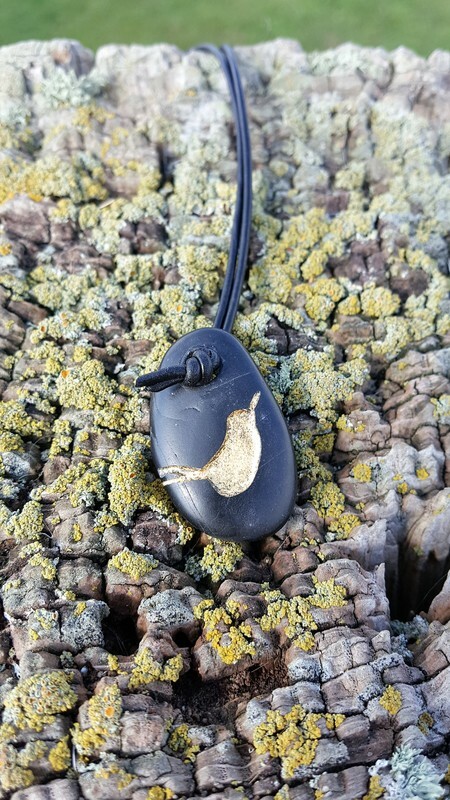 Huge, sterling silver textured heart hanging on a thick black leather thread. 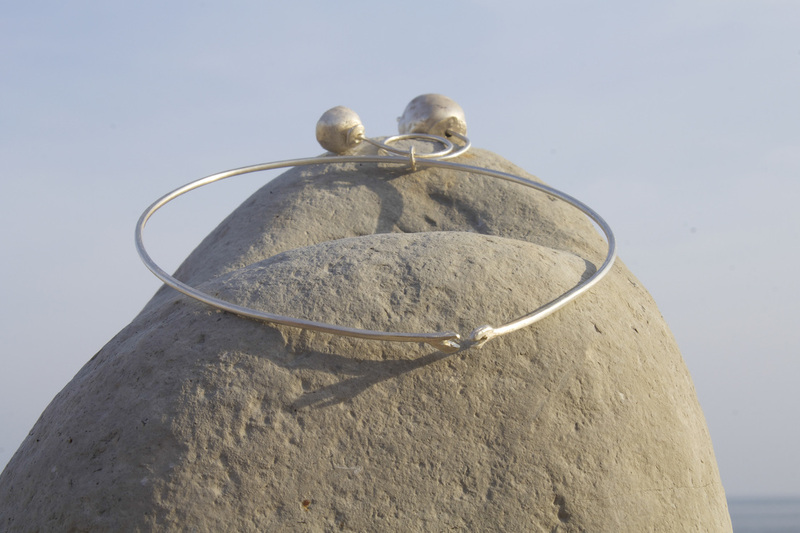 Dangling, moving cups on a curved, flattened silver hoop, hanging from a hammered sterling silver hoop. Back detail echoes the cup stems. 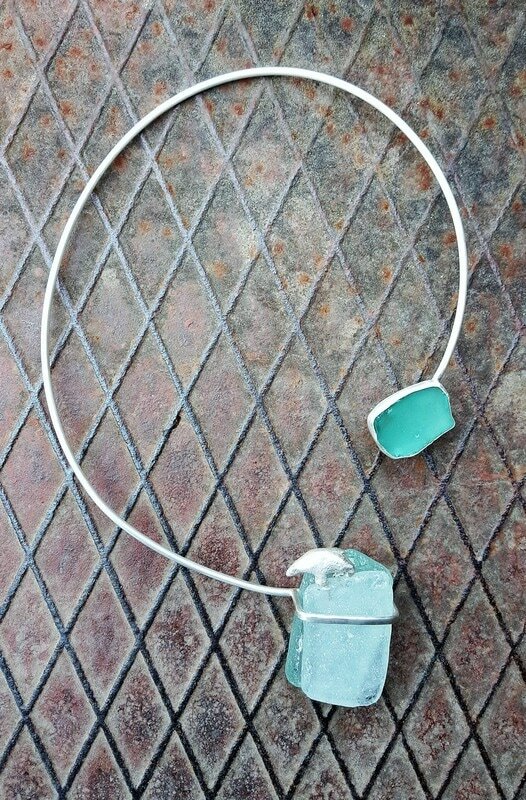 Green, aqua and frosted white sea glass statement necklace with silver pebbles and heart. On a 2mm wire. 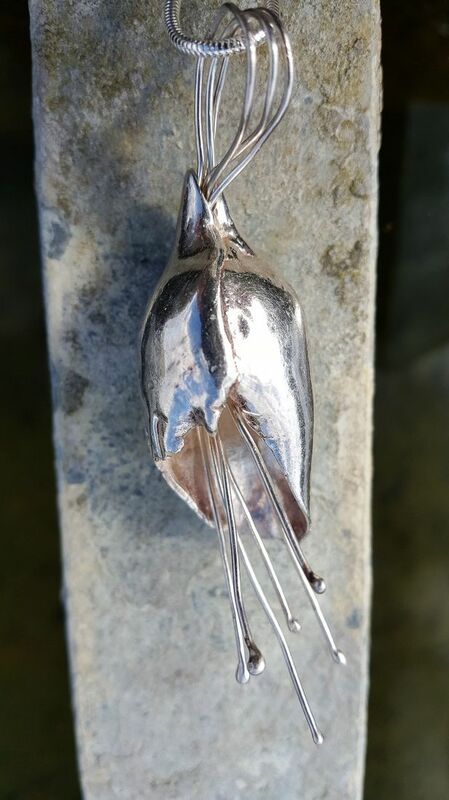 Flattened sterling silver wire necklace with creamie pebbles and hanging hoop. 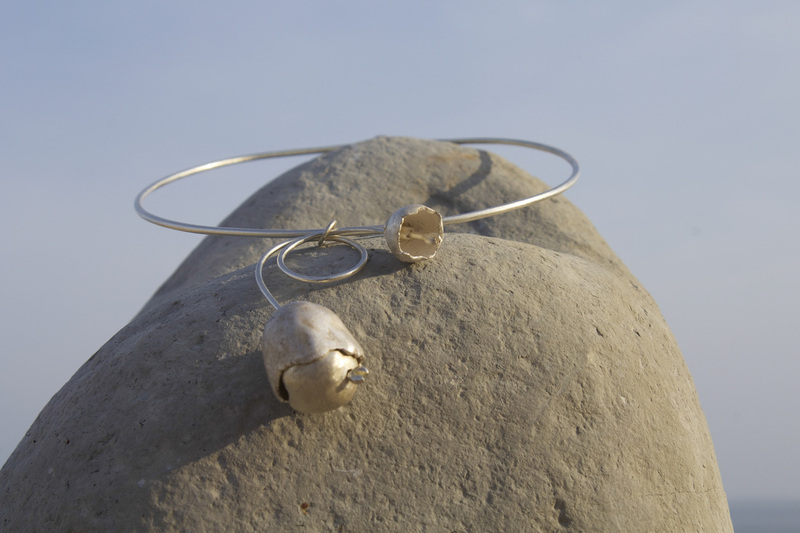 On the hoop is a heart pebble, a small pebble and a dinky silver cup containing a tiny golden nugget. 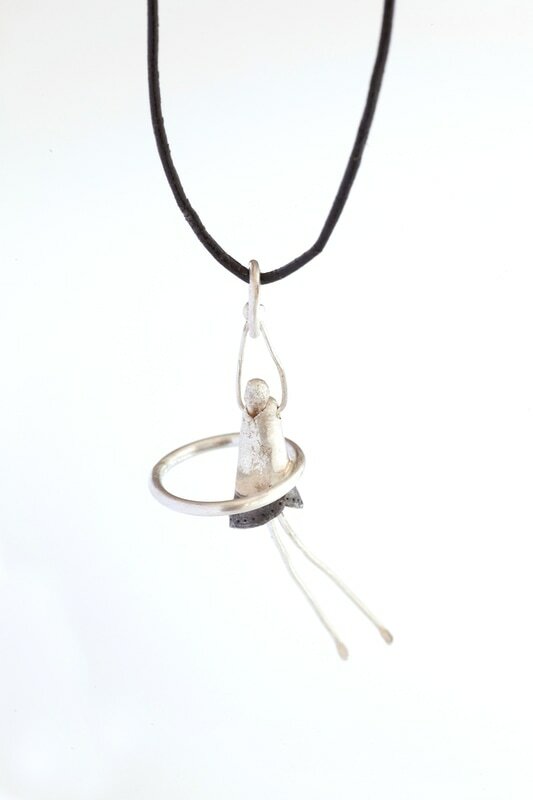 Back detail is 2 hand made silver pebbles.